Agatha Christie’s And Then There Were None is the best-selling crime novel of all time, with 100 million copies sold worldwide, and now for the first time the book will be adapted into a major new television series for BBC One. With an illustrious cast in place, Mammoth Screen and Agatha Christie Productions have begun filming a three-part adaptation of the author’s masterwork, by Sarah Phelps (The Casual Vacancy, Great Expectations). Douglas Booth (Great Expectations, The Riot Club) as Anthony Marston, Charles Dance (Game Of Thrones, Imitation Game) as Justice Lawrence Wargrave, Maeve Dermody (Black Water, Beautiful Kate) as Vera Claythorne, Burn Gorman (The Dark Knight Rises, Torchwood) as William Blore, Anna Maxwell Martin (The Bletchley Circle, Death Comes To Pemberley) as Ethel Rogers, Sam Neill (Peaky Blinders, The Tudors) as General John MacArthur, Miranda Richardson (Mapp & Lucia, Parade’s End) as Miss Emily Brent, Toby Stephens (Black Sails, Jane Eyre) as Dr Edward Armstrong, Noah Taylor (Peaky Blinders, Game Of Thrones) as Thomas Rogers and Aidan Turner (Poldark, The Hobbit Trilogy) as Philip Lombard form a stellar ensemble cast. Sarah Phelps (The Casual Vacancy, Great Expectations) is writer and executive producer, the director is international award-winning Craig Viveiros (The Liability, Ghosted), the producer is Abi Bach (The Honorable Woman). The executive producers are Mathew Prichard and Hilary Strong for Agatha Christie Productions Ltd, Karen Thrussell and Damien Timmer for Mammoth Screen and Matthew Read for the BBC. 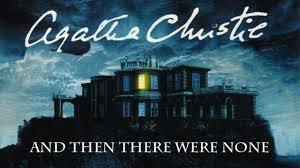 UK transmission will be later this year to coincide with Agatha Christie’s 125th anniversary. It will air in the US in 2016. Can’t wait! Bummer that the U.S. has to wait until 2016.